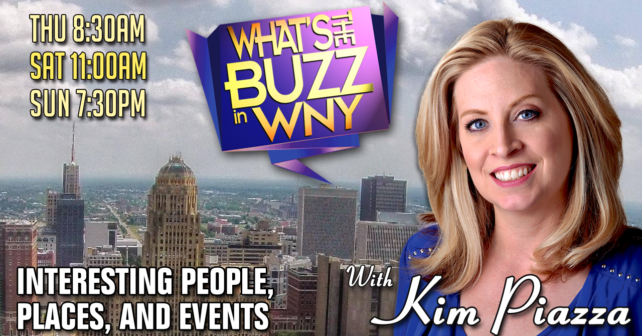 Every week, Kim Piazza introduces us to interesting people, places, and hometown businesses on “What’s The Buzz in WNY” – Thursday morning at 8:30am; Saturday morning at 11am; and Sunday evening at 7:30pm. If your business would like to participate, give our Production Manager John Di Sciullo a call at 716-989-8866. Your company can enjoy the results our award winning production team can deliver for you! This month, Kim takes us to the Williamsville and Lockport locations offering affordable senior apartment living, with everything you need! Then, find out how you can make your home safe for independent living, especially if you need a lift, ramp, or even an elevator. Going out on the town? Kim will help you look your best. Plus, Kim makes your home come alive this spring with incredible antiques, flowers, and decorations. WBBZ is seen throughout Western New York over-the-air on digital channel 67.1. Ch. 5 on Verizon FiOS (HD 505); Ch. 5 Dish; Ch. 67 DirecTV, and these Spectrum Cable channels: Buffalo – Niagara Falls Metro area: Channel 5 (HD 1230); Batavia – Genesee, Wyoming, Orleans Counties Channel 71 (HD 1230); Parts of Erie and Niagara Counties Channel 71 (HD 1230); Dunkirk Channel 5 (HD 1230); Olean Channel 5 (HD 1230); Fredonia – Jamestown Channel 72 (HD 1230); Alfred- Angelica- Avoca- Bath- Bolivar Friendship- Hornell Channel 5 (HD 1230). WBBZ-TV programs can also be viewed on our WBBZ TV YouTube.com channel anytime.